Publication date: 16 December 2008. Solid State Drives are devices that use memory chips to do the job of a magnetic disk. Those early SSDs generally used ordinary "volatile" RAM chips, which lose all of their data when you turn them off. 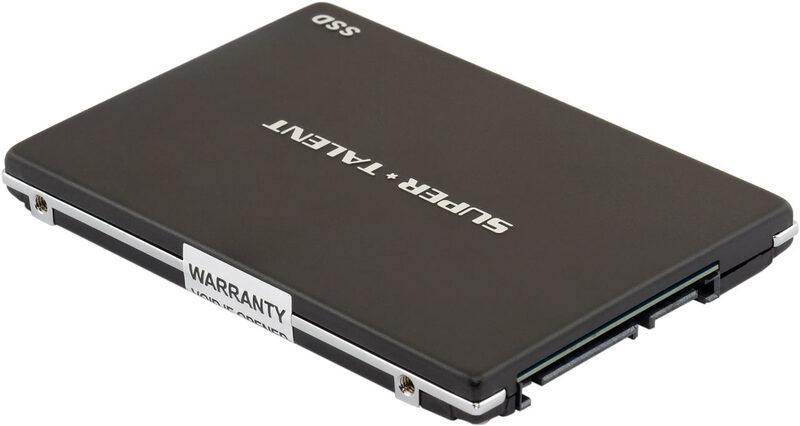 The SSDs usually had magnetic-disk backup of one kind or another, often including a standby power supply so everything wouldn't get dropped on the floor if the SSD drive lost power. The modern-PC equivalent of these devices is Gigabyte's oddball "i-RAM". Then there was a little branch of the SSD family tree into small-capacity non-volatile devices for devices like personal organisers. Older ones used battery-backed memory, newer ones used the older flavours of Flash memory, which is truly non-volatile; it doesn't need power to maintain its contents. 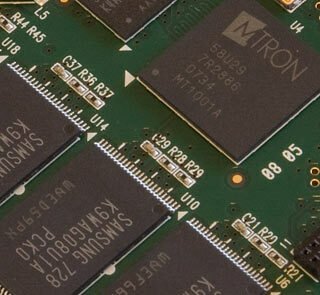 Now, Flash-RAM SSDs are becoming mainstream consumer products. They're still not as capacious as conventional moving-parts hard drives, and they remain a lot more expensive per megabyte. But you don't have to be even slightly crazy to buy one today. So here's a comparison of four currently-available Flash-RAM SSDs. Plus one little ring-in - that's the extra 0.1 in the shootout. 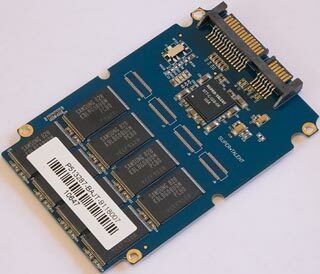 Here are the four "proper" SSDs. They're all SATA devices, in the 2.5-inch form factor, the same as current laptop hard drives. A 2.5-inch enclosure is more than big enough for the guts of all but the highest-capacity consumer SSDs. Many consumer SSDs come in 3.5-inch versions as well, but the larger models often seem to cost rather more for some reason. Since SATA cables plug into 2.5-inch drives just as easily as they plug into 3.5-inch ones, you might as well get the smaller drives and a mounting kit to install them in larger bays. Since these drives are lightweight and functionally shockproof, you don't actually, strictly speaking, need to mount them properly at all. You can also just leave them unrestrained except by their cables and resting on top of another drive, or hold them in place with some gimcrack arrangement involving cardboard and tape and rubber bands. These drives don't have an exposed circuit board on one side, so you don't need even the traditional sheet of paper that you have to lay under a bare 3.5-inch drive when you're plugging it into a computer temporarily. Obviously, none of this is recommended practice, but you'd better believe I didn't waste time screwing the drives into the test machine when I was benchmarking them. First up, an OCZ Technology Core Series V2 SSD, yours for $AU198 delivered from m'verygoodfriends at Aus PC Market. The OCZ is the most featureful of these drives - which is to say, it's got one more feature than the others. There in the corner of the back of the drive is a mini-USB connector. Yes, you can plug this drive into a computer via a single USB lead, and it'll show up like a normal thumb-drive. This is a neat feature, especially because it doesn't seem to add much of a price premium. I doubt many people will be carrying a 2.5-inch SSD around as a USB drive, but having the option to connect it this way makes it rather easier to clone a laptop drive onto it, or do various other tricks. And it's not even all that expensive when compared with USB-only thumb drives; AusPC will be pleased to sell you a fancy brand-name 32Gb thumb-drive for the same price as the OCZ drive. The current eBay rate for a less-famous-brand 32Gb thumb drive is around half that, mind you. Regrettably, though, neither that thumb-drive nor any "32Gb" SSD is able to actually hold thirty-two gigabytes of data. 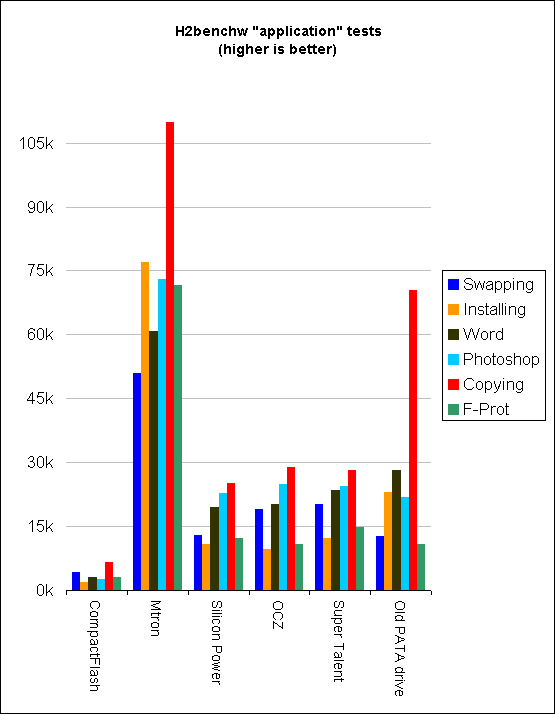 This is because SSD manufacturers, like all other storage manufacturers, are staunch defenders of correct SI prefixes. Which just so happen to make their products look better than they are. Le Système International d'Unités is very clear about this, you see. Kilo means thousands, mega means millions, and giga means billions. So a 32-gigabyte SSD should have a capacity of 32,000,000,000 bytes. And it very probably will. Perhaps a bit more, but not a lot more. This is all very well, except for the fact that binary computers use the same prefixes to indicate powers-of-two, where kilo means 1024 (two to the power of ten), mega means 1,048,576 (2^20), and giga means 1,073,741,824 (2^30). So the confusion continues. Storage devices still have powers-of-ten capacity numbers, and computers still report device capacity in powers-of-two numbers, and just formatting a drive eats a little bit of capacity too, and consumers end up feeling ripped off. Now that consumer hard drives have cracked the one-terabyte line, the rip-off factor has become even worse. The megabyte-to-mebibyte rip-off factor was only 0.954 (one divided by 1.048576); gigabyte-to-gibibyte was 0.931. But terabyte-to-tebibyte is 0.909; you're getting only about 91% of the capacity you thought you were paying for. I will try, in this review, to use the silly mebi- and gibi- prefixes, and not the ambiguous Mb or Gb unless I just used the long word earlier in the same sentence. I'll probably fail somewhere, though. Many drive manufacturers actually give you a bit more capacity than you'd expect from their powers-of-ten fixation, but you never know how much you're actually going to get. It's likely to vary slightly between individual drives, too; many drives have a few bad blocks when they come off the production line, and mapping those out gives tiny capacity differences between nominally identical devices. To be fair to OCZ, their Core Series V2 lineup is officially "available in 30GB, 60GB, 120GB, 250GB capacities", not the usual 32Gb, 64Gb, 128Gb and so on. The OCZ drive I got for review is, therefore, officially 30Gb. It has an unformatted capacity of 30,560 megabytes; formatted with NTFS, that gave me exactly 32,041,332,736 bytes, which is 29.8 "real", power-of-two, gigabytes. Rip-Off Factor: Well under one per cent. Yay OCZ! The capacity rip-off factor doesn't really matter much for consumer hard drives, because they're so very big and so very cheap. The rip-off factor may get worse every time we get three more digits on the capacity number, but the price per megabyte has been plunging so fast that it's hard to complain. SSDs still cost a lot more per megabyte than normal hard drives, though, which makes it more annoying when one of them has a "32Gb" sticker capacity and turns out to be only 29.8 formatted "gibibytes" - or even less. Given the sub-$AU200 price of the OCZ drive, even if it were officially 32Gb, you'd only be missing out on about $AU14 worth of capacity. But I bet you'd still rather have had it all. Aaaanyway, here's SSD number two: An Mtron unit, yours for the not-very-round sum of $AU413.82 delivered from Aus PC Market. The Mtron's got a 32Gb sticker capacity, and its real unformatted capacity is the same as the OCZ one - 29.8 gibibytes. Rip-Off Factor: About 7%. The higher purchase price means you're paying $AU13.88 per unformatted gibibyte for the Mtron drive, though. The OCZ drive costs only $AU6.63 per unformatted gibibyte. Candidate three: A Silicon Power SSD, which costs only $AU170.50 for "32Gb". Actual unformatted capacity turned out to be only 28.2 gibibytes, though, bringing the cost per unformatted gibibyte up to $AU6.06. This drive has, at the time of writing, just been replaced by an allegedly-faster unit, with the same model number. So there's a good chance that if you buy this drive, you'll get a faster one than I had. The last of the "proper" SSDs in this comparison is a Super Talent unit, an FTM64GL25H from their MasterDrive OX SATA-II series, to be exact. Which Aus PC Market aren't selling any more - I think it may be getting replaced by a newer unit. Don't expect this Super Talent drive to be cheap wherever you find it, though, because it's got 64Gb sticker capacity, which adds up to 59.7 unformatted real gibibytes. That's a 4Gb CompactFlash memory card - a no-brand eBay super-cheapie - in an ATA adapter. CompactFlash cards are, you see, native ATA devices. Just plug them into the right pin adapter, and every CompactFlash memory card ever made will talk perfectly happily to a computer motherboard's PATA controller. The adapters have been around for years - I reviewed one back in 2000. The one in the above picture is electrically the same as that old one - down to the socket for a floppy-drive power plug to make the thing work. But this one has a male 40-pin plug on it instead of the usual female, which allows you to plug the adapted card straight into a motherboard PATA socket, without even bothering with a cable. Older CF cards didn't support DMA transfer modes, only the slower and CPU-intensive PIO. This meant they wouldn't have been much use as a system drive for a proper computer (as opposed to a stripped-down Linux network appliance), even if they'd been big enough, which they weren't. You can only write to Flash RAM so many times before it dies, so small-ish Flash devices used as the system drive in a computer that has virtual memory will be beaten to death quite quickly, as I mentioned back in 2005 in this piece. Most Flash devices include "wear levelling" in their controller hardware, which spreads writes out all over the device no matter what part of it the device that's using it for storage thinks it's writing to. For a small Flash device used as a scratch disk, though, this just means the thing'll die after a few weeks, rather than a few days. A couple of years later, though, the incredible increase in memory-card capacity led me to write this new piece. Gigabyte-plus CF cards were still on the pricey side, but they weren't completely out of the question, and the extra space plus wear-levelling equalled plausible service for at least a few years as a scratch disk. And nowadays, multi-gigabyte memory cards are practically free. I sniped the 4Gb CompactFlash one in the above picture on eBay a couple of months ago, for six US dollars and fifty-five cents, delivered. The ATA adapter didn't cost me much, either. I bought a bag of three of 'em for $US9.88 delivered. So you'd think this'd be the obvious number-one choice for anybody looking to mess around with SSD-ing on the cheap. But there's one more trap. 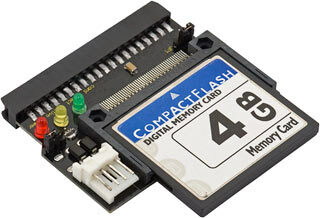 Most CompactFlash cards report themselves as a "removable" device, not a "fixed disk". There's no good reason for them to do that - cameras don't care, and any memory card in a USB reader will look like a removable device - but most of them say they're removable anyway, and cannot easily be changed. There are little utilities that're supposed to flip the appropriate bit in the firmware, but no manufacturer hands the utilities out. So nobody's exactly sure which utility will work on which card, which will fail harmlessly, and which will leave you with a coaster just big enough for a shot-glass. The removable/fixed thing matters because it bothers Windows. You cannot install Windows on a "removable" device, and Windows also won't let you do some other stuff with "removables", like make a RAID array including one, or even put a swap file on it. This all makes perfect sense for devices that really are able to be unplugged at any moment, but it's stupid for a device that's inside your computer and plugged into an IDE lead. Still, that's the deal, and it's not easy to find cheap "fixed disk" CompactFlash cards. But, as it turned out, my super-cheap 4Gb card does report itself as a fixed disk! So, you know, ask for it by the brand it does not have! The nice chaps at Aus PC Market kindly provided me with a whole tweaky 3.33GHz Core 2 Duo E8600 system for testing these drives. I was meant to do a bit of a review of the system and the case it came in too, but the case didn't impress me at all and the computer demonstrated its high-performance-ness by screwing up every time I powered it up with a new drive connected. Which was something that I did quite often, in the course of writing this piece. So you'll not be hearing much about the test system. It ripped along just fine whenever its RAID controller wasn't having kittens over OMG A NEW DRIVE HAS BEEN CONNECTED I MUST ADD IT TO THE BOOT RAID OMG IT DOES NOT FIT, so I am at least not worried that it messed up any of the figures. And it's all new and shiny, so it definitely supports the new 300-megabyte-per-second version of SATA, which everybody calls SATA-II but which the Serial ATA International Organization are getting angrier and angrier about telling us all should be called "SATA 3Gb/s +". Which isn't what they were telling us all to say the last time I checked (the "+" is new), but OK, no problem; "SATA three-gub slash S plus" it is. There you go, lads. The interface speed never makes a lot of difference to storage device speed, unless your storage devices can actually shift data fast enough to use all of the interface bandwidth, which is very seldom the case. 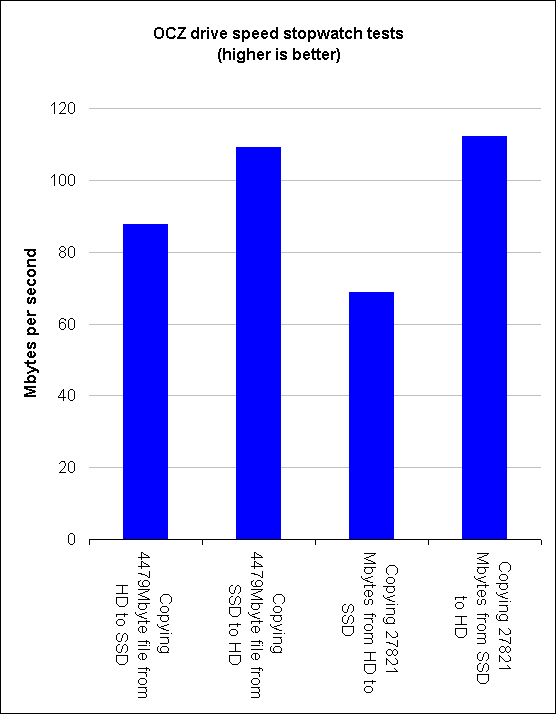 Hard drives can move data at full interface speed until their buffers fill, but those buffers are in the tens of megabytes at most, which isn't much compared with the drive capacity. SSDs can be expected to use the interface in a rather different way from spinning-disk drives, though, because they've got almost no latency. Hard drives have seek latency - the time it takes to move the read/write heads to the right part of the drive, and select the right head for the platter you want to access. They also have rotational latency - how long you have to wait for the right part of the drive to spin around under the head. 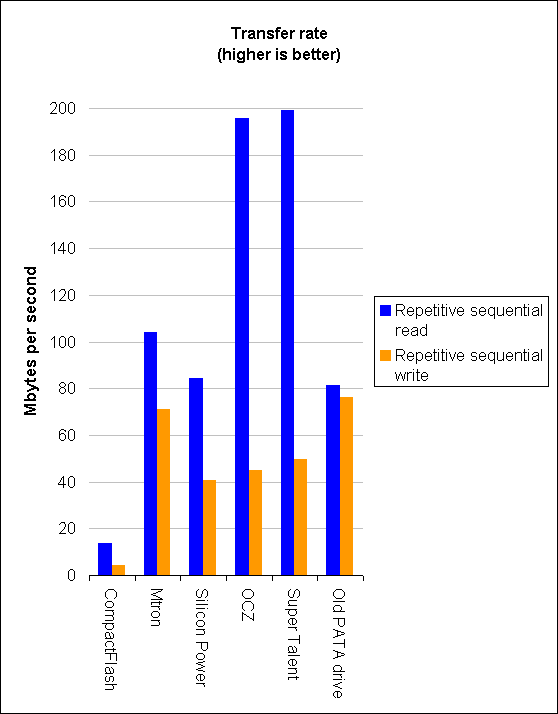 SSDs have very small, though not zero, seek latency, and no rotational latency at all. SSDs based on volatile dynamic RAM, in fact, have pretty much no access-slowing quirks at all. Flash-RAM SSDs like these, though, have a problem with writing. Not only can you only write to a given Flash RAM cell so many times (though the number may now be so high that it's really not a problem for domestic use - it's not as if spinning hard drives won't wear out after a while too), but it's actually impossible to write to just one Flash RAM cell. The smallest possible write unit for Flash RAM is a rather larger block of cells, all of which have to be erased and rewritten even if you want to change only one single bit of data. This phenomenon manifests itself as generally lousy write speeds for Flash devices, and to really lousy seek times, if each seek is followed by a write. In the real world, you're probably not going to be seeking all over a disk and writing tiny bits of data every time you touch down. There are some particularly pathological tasks that'll do this - horribly fragmented filesystems, perhaps, or multi-user databases with poorly-set-up caching - but by and large, it's not an issue. But I mention it anyway, to prepare you for the entertainingly awful write-seek numbers you're about to see for some - but, interestingly, not all - of these SSDs. To benchmark the SSDs, I went straight for a heavy-duty if somewhat obscure program melodiously titled "h2benchw". It was made by c't magazine for their own use, and seems well-thought-of. Don't ask me if it really makes numbers any more ironclad than Iometer, the usual choice in ironclad hard-disk benchmarks. I chose h2benchw mainly because I could figure it out much more easily than I could Iometer. This is saying something, when you consider that h2benchw's main documentation is only available in German, which I do not speak. The usual procedure when you benchmark hardware is, you spend rather a while running a benchmark on umpteen devices, and then you make a big spreadsheet and try to figure out what, if anything, you've just managed to measure. There's a deadly temptation to assume that anything you've worked on for days must be worthwhile. When it comes to computer benchmarking, though, you can spend all week making numbers and very easily end up with no actual useful data at all. So I'm not going to stake my life on any of these results - especially because some of them look rather peculiar. I don't think I wasted my time making them - but then, I would say that, wouldn't I? At least I didn't use Sandra. OK, on with the show. First, sustained transfer rate - the drag race of hard-drive specs. Ooo-wee, look at the OCZ and Super Talent go! They're both near as dammit to two hundred megabytes per second for sustained reads, which is just outrageous. The generally-fastest SATA three-gub slash S plus hard drive in the world today is Western Digital's 300Gb, 10,000RPM VelociRaptor, which looks not unlike a laptop drive, but isn't. Its sustained sequential transfer rate peaks at about 120 megabytes per second, but bottoms out (on the inner, smaller tracks of the drive) at barely more than 80Mb/s. These SSDs should give you this frankly incredible read rate for the whole darn drive. Eagle-eyed readers (click the graph for an un-cropped, un-scaled version) will notice not only that I appear to have gotten my money's worth from the super-cheap CompactFlash option as far as transfer rate goes, but also that there's a sixth competitor over on the right-hand side. That's an old Parallel ATA 7200RPM Western Digital drive that I happened to have sitting around, which I threw in as a bog-standard spinning-disk comparison device. Its sticker capacity is "300Gb", and it has almost exactly 300 billion bytes of actual unformatted capacity, which adds up to 279.46 gibibytes. The test system was booting from a pair of current-model 300Gb SATA drives in a RAID 0 stripe-set running from the motherboard's pseudo-hardware SATA three-gub slash S plus RAID controller, into which I also plugged the test SSDs. I ran h2benchw on the boot array as well, but couldn't do any write tests, since h2benchw is like other industrial-strength HD benchmarks in that its write tests are data-destructive. So it won't let you do them if there's so much as a partition on the test drive, much less if you're booting your computer from it. The boot array managed a sustained 128-sector read rate of 123,703.5 megabytes per second, 2.4 times the old 300Gb drive's figure and right up there with a single 300Gb VelociRaptor. But the RAID array only patchily beat the old drive in the tests I'm about to get to, and actually lost for a couple of them. So what I'm saying is, I may have dredged this old drive up from the depths of my "don't trust these for anything important" box, but it's close enough in performance to modern consumer ATA drives to still be useful in a ballpark comparison with the new SSD kids on the block. Once you get past the skyscraper read speeds for the OCZ and Super Talent drives, you'll notice, one, that the "slow" SSDs really aren't that slow, and two, that the write-speed penalty for the Mtron SSD in particular does not seem to be large. And that whatever voodoo the OCZ and Super Talent drives are using to get their monstrous read speeds does not seem to work on write speeds to, since they manage little more than a fifth of their read speed when writing. I was frankly suspicious of the sustained transfer rate numbers for the two fastest SSDs, so to see whether they were just some weird artifact of the benchmark software, I put an NTFS partition on the OCZ drive and tried a good old-fashioned stopwatch test. You start copying a bunch of files to the drive in Windows, and you press the button on your stopwatch. You press the button again when the copy dialog goes away. Then you reboot to clear caches, and copy the data back, timing it again. This is not a world-class high-accuracy benchmarking technique. The sloppiness of your finger on the stopwatch button ain't the least of it - Windows does all sorts of cunning caching to speed file copies up, and about all you can say for the moment when the copy dialog disappears is that it definitely does not mark the moment when a copy operation from one internal drive to another has finished. But it's close enough for government work, or verifying freaky numbers from other benchmarks. So here are the results. I copied one DVD-R-sized file for the first test, and nineteen files totalling 27.1Gb for the second. There's that caching I was talking about, making the write operation look significantly faster for the smaller amount of data. It looked like a write speed of about 88 mebibytes per second for the smaller copy; the larger one settled down to about 68.9Mb/s. Read speeds - including writing to the computer's boot RAID array - stayed pretty steady for both tests. What do the stopwatch tests tell us? Well, if you're reading a ton of data from a super-fast SSD and that data actually has to go somewhere, you shouldn't expect to see stratospheric transfer rates. But the read speeds are still well over a hundred megabytes per second, which is still seriously fast. If you're booting your computer from this SSD - which means at least some of the read data will just be going to RAM - you're going to be looking at a desktop a lot sooner than you'd expect. And the real-world stopwatch write speeds for the OCZ SSD are actually rather faster than h2benchw said they'd be. It only got 45 megabytes per second in the h2benchw sustained-transfer test, but 68.9Mb/s in this one. That's more than slightly due to caching, but it's not as if I was moving a tiny amount of data, here; if you're dumping a lot of gigabytes to this SSD in an operating system with any caching brains at all, you're not going to be waiting around as much as you might think. OK, back to the humourless German command-line benchmarks. It's seek speed time! In this graph, you want a small bar, not a big one. Not everybody has managed to achieve a small bar. H2benchw does four different tests, here. First, there's the standard sort of seek test, where it randomly reads single sectors all over the disk. Everybody did fine in that test. Next, it randomly writes tiny bits of data all over the disk. I told you the SSDs wouldn't deal well with that, and indeed they did not - except, weirdly, for the Mtron, which didn't bat an eyelid. I presume it's got some clever caching of its own going on. The Silicon Power, OCZ and Super Talent drives, I feel safe in saying, royally sucked for this test. They lost to my $6.55 CompactFlash card, for Pete's sake. Now, this doesn't actually matter very much, as I explain above. You probably don't want to do anything that very much resembles this test to your drives. But if you do... well, I suppose you want the Mtron. The next two tests h2benchw does are like the last two, except it restricts them to one 504-mebibyte area of the drive. This is actually a fairly realistic test of some access profiles, like flogging the swap file on a hard drive. It considerably cuts down on seek latency for traditional hard drives, bit does nothing for rotational latency. The smaller bars in the above graph are all practically invisible, because the Y axis is tall enough to accommodate the 200ms-plus Silicon Power, OCZ and Super Talent random-write numbers. 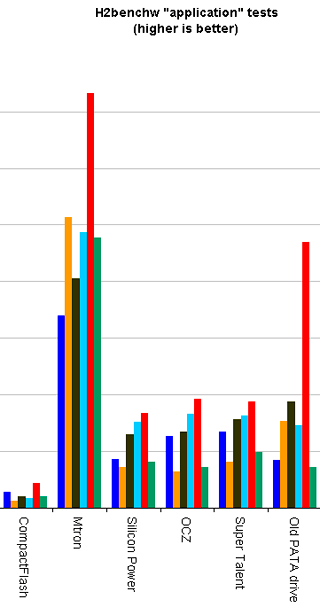 So let's allow those bars to shoot off the top of the graph, and look at just the bottom fifteen milliseconds. 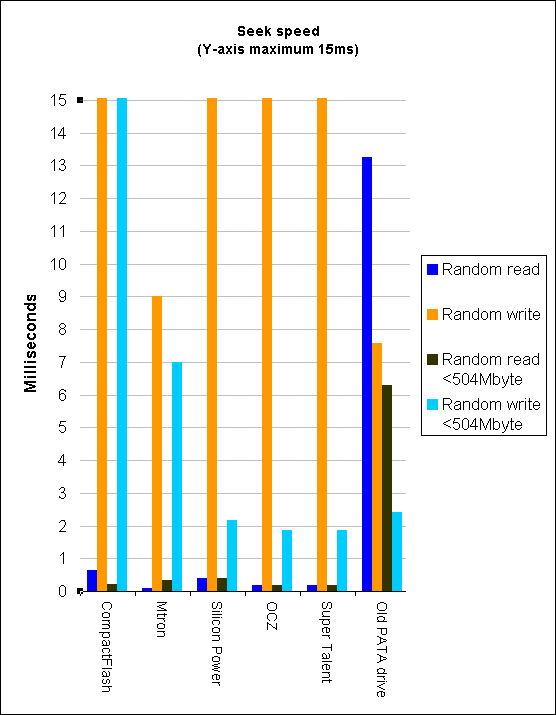 All of the Flash devices have vanishingly small random-read times compared with the old 300Gb drive - and the Silicon Power, OCZ and Super Talent may have woeful whole-drive random-write numbers, but they (very narrowly) beat the spinning disk for sub-504Mb random writes. And the Mtron's odd - way better than the other SATA SSDs for whole-disk random writes, notably worse than even the spinning disk for sub-504Mb random writes. What this augurs, I know not. Ponder ye the flight of swallows. 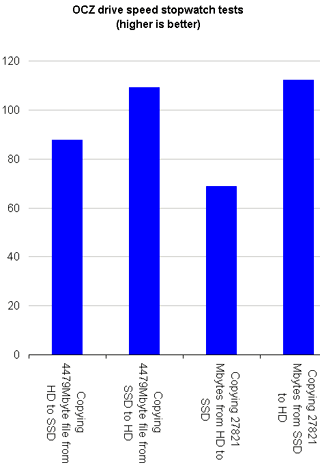 The final bunch of benchmarks h2benchw offers are "application" tests, which attempt to mimic the disk usage of a selection of common programs. And here's how all of these drives did in those tests. The current h2benchw readme warns you that these tests are out-of-date and should no longer be taken to mean anything in particular, but I bloody did 'em, so you're bloody well going to see the results. The red bar that shows the old PATA drive to be so superior to every SSD except the super-performing Mtron is the "copying" test, which was never designed to test the performance of any normal application in the first place. 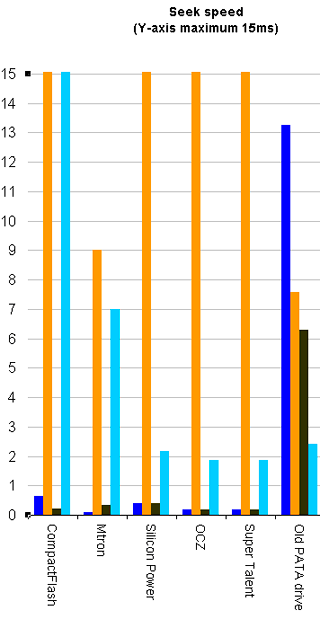 The next-most-dramatic result is the orange bar, which represents the "installing" test. That isn't likely to be a big deal either; even assuming it does actually tell you something about installing a modern application, it's not as if you're often sitting there twiddling your thumbs and grumbling about the length of time a program takes to install. But the Mtron is clearly superior for all of the other app tests, too. Again, your guess about what this actually means is as good as mine. And, once again, there's the humble CompactFlash card in its dignified last place. A super-fancy brand-name CompactFlash card would probably have given less disappointing results, but as the speed and capacity rise so does the price, until you're not necessarily looking at much of a deal. My no-name CF card with its 3.8 real gigabytes of capacity cost me about $US2.60 per gigabyte, including the price of the adapter. That's cheaper than the SSDs, but not by nearly as much as you'd expect - the Silicon Power SSD, for instance, comes in at only slightly more than six Australian dollars per gigabyte, which is about four US dollars as I write this. If you try for more performance by getting, say, a SanDisk Extreme III 16Gb card, then as I write this you're not going to be looking at less than about $US110 delivered for the card and an ATA adapter. Given the 15.2Gb-ish real capacity of the card, you'll be paying more than $US7.20 per gigabyte for it. If you only need 16Gb or less capacity in your SSD, then an adapted memory card could still be a great idea. Price per gigabyte may not be incredibly low, but you can still end up paying a lot less than you would for a rather larger SSD with a slightly higher price per gig. But if you want a good-sized drive, get a purpose-built SSD. Oh, yes - the OCZ drive has a USB socket, doesn't it? So I tried plugging the OCZ drive into the test system via USB cable, and h2benchw'd it again. The raw bandwidth of USB 2 is 480 megabits per second, which is only 57.2 mebibytes per second before umpteen layers of framing and error correction and so on get spread all over it. So the OCZ drive's staggering 195.7-mebibyte-per-second raw SATA three-gub slash S plus read speed dropped to 33.3Mb/s over USB, and everything else suffered too, though not as badly. Overall, it was about 0.5 to 0.7 as fast for the rest of the tests in USB mode as it was in SATA mode. This still leaves the OCZ drive up among the faster USB storage devices, but there's nothing special about it in this mode, beyond the fact that it has USB mode in the first place. And you don't have to pay much extra to get it. Just when I thought I was out, you readers pull me back in. After this page went up, a couple of readers inquired about what RAM and controller chips lurked inside the SSDs. This can be of some importance, because there are a couple of flavours of Flash in SSDs today, and they can perform quite differently. The first flavour is the original type, "single-level cell" or SLC, which stores one bit of data per cell. But recently "multi-level cell" or MLC memory has come out, which can store more than one bit per cell, and is cheaper for a given amount of storage. So what flavours of Flash do you get in these SSDs? Well, both the Silicon Power and OCZ drives are controlled by a JMicron Technology JMF602 "SATA-II and USB 2 to NAND flash interface" (PDF datasheet here), which is an MLC controller that has achieved a certain notoriety online. Here it is, along with one RAM chip, on the OCZ circuit board. The Silicon Power has the same controller chip, but without the USB part hooked up to anything. 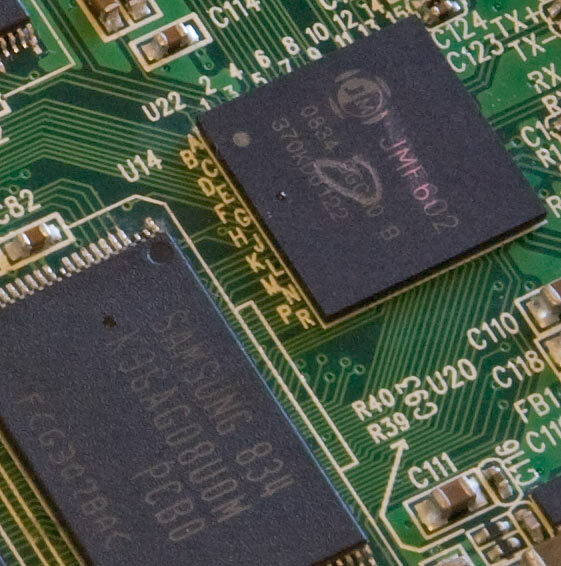 The problem with JMF602-based SSDs - of which there are apparently quite a few - is that this inexpensive controller chip has no buffer RAM at all. 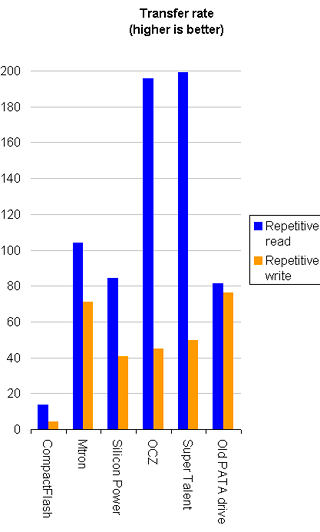 This explains the woeful random-write performance of the OCZ and Silicon Power drives; random writes are being made directly to the flash, and seeing the full penalty of the erase-a-whole-block-before-you-can-write-one-bit limitation of all flash RAM. The other SSD that had very poor random-write results was the Super Talent. Here's its whole circuit board. The SSD boards all have the same basic configuration - bunch of RAM chips and a controller on one side, another bunch of RAM chips on the other. 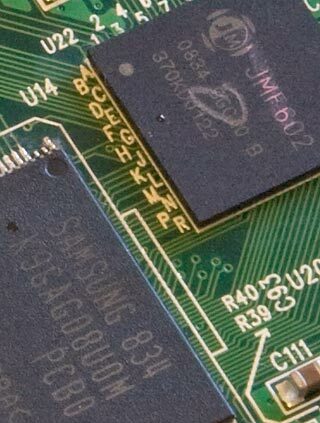 Super Talent put their own name on the controller chip, so I just looked up the the RAM chips. They're Samsung K9LBG08U0Ms, which are MLC large-block NAND Flash. So here's another MLC drive, with another cheap unbuffered controller. The Mtron drive, on the other hand, scored very well for random writes. So what's inside that one? 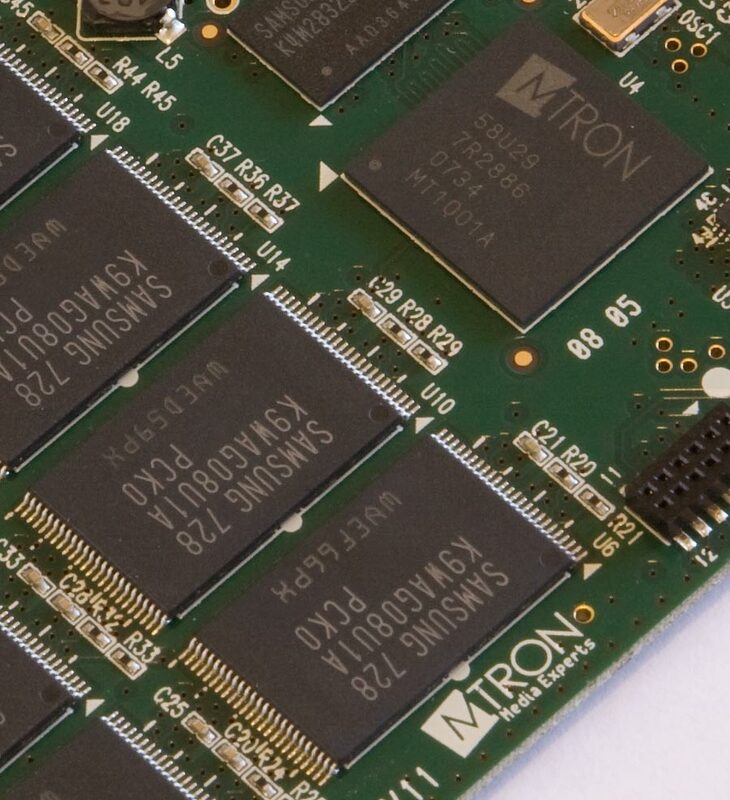 Mtron themselves are in the Flash controller chip business, so of they used one of their own chips, too - a "58U29" that I can't find any info about. I had more luck IDing the RAM chips, though. Here they are on Samsung's site, categorised as "SLC-large block NAND Flash". So this drive's SLC, presumably with a buffered controller. Which is why it costs (a lot) more per megabyte. It is possible, in real-world situations, for MLC SSDs to occasionally perform atrociously badly. Some application pauses while it writes a tiny file, which ought to take pretty much no time at all, but which actually ends up taking the better part of a whole second to complete. That might not sound like much, but it's a lot if your whole computer freezes while it happens, and it happens often. And apparently the problem can even prevent you from doing some things - like installing Vista - at all! 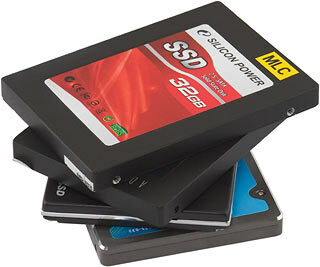 More probably, these (relatively) cheap MLC SSDs are just going to behave more like a spinning disk than you expected. When two or more applications are simultaneously accessing a hard drive, the heads will be flogging back and forth and the drive's performance will be much worse than the one-divided-by-the-number-of-applications that you'd expect. Since SSDs have near-zero seek time, you'd expect this problem to not arise - but with cheap MLC SSDs, it still can. I saw this phenomenon in the h2benchw results, once I knew what to look for. The seek speeds in the graphs above are the average figures, and the SLC MTron drive was quite consistent; its worst random-access write times were about 35 milliseconds, which is perfectly acceptable as long as it only happens occasionally. 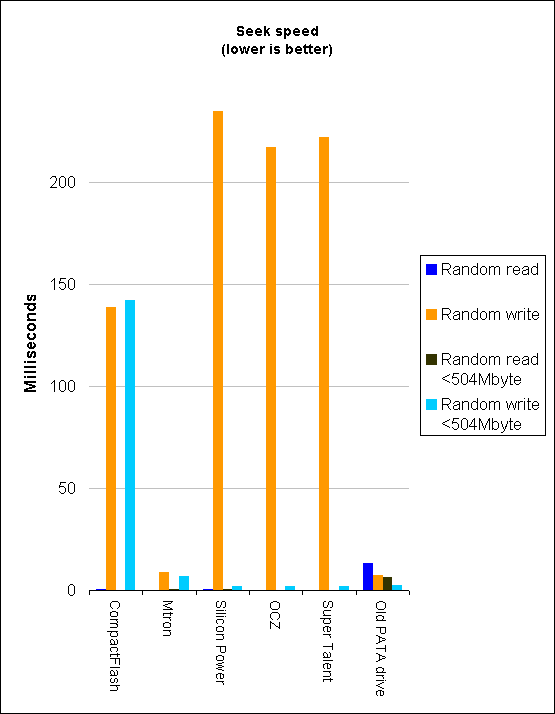 The three cheaper MLC SSDs, though, all had an alarming maximum seek speed figure in their whole-drive random-access write benchmarks. 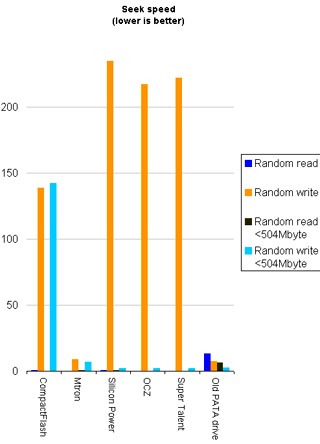 The averages were just fine, but the OCZ drive had a worst whole-drive random access write figure of 447 milliseconds. The Super Talent scored 905ms, and the Silicon Power managed a magnificent 1006ms. That's a whole second waiting for something that'd take any old hard drive 20 milliseconds to do, tops. This isn't a killer problem by itself - well, unless you find that you can't install Vista on the SSD boot drive of your new computer. Arguably, the ultra-fast performance of even cheap SSDs most of the time outweighs their hiccupping some of the time. And most people with an SSD in a PC will have at least one conventional hard drive as well; you can put temp directories and the swap file and so on on the spinning disk to avoid flogging of the SSD. The MLC-SSD pausing problem does, however, make these drives entirely unsuitable for multi-user server applications. If the raw test numbers were making you think SSDs could do the job of a RAID array, think again. There are various tweaks you can use to reduce, or entirely eliminate, the MLC-SSD performance problems. You can apparently completely solve the problems, and get considerable other advantages, by using commercial "Flash SSD Acceleration Software" for Windows and Linux called Managed Flash Technology, or MFT. MFT pricing starts at $US125, though, so it's not what you'd call an impulse buy. A more attractive option for Windows users, price-wise at least, is Microsoft's free Windows SteadyState application for XP and Vista. SteadyState is meant to lock down Windows systems so users can't change things, but it achieves this by caching all write activity, which is just what you need to speed up a MLC SSD. SSDs are no longer only for big iron and loony money-no-object "enthusiasts". They're still not truly cheap, of course. But this is mainly because the hard-drive industry isn't so much moving the goalposts, as they've loaded the goalposts into the back of a truck and are driving away as fast as they can. As I write this, you can get a "750Gb" Samsung hard drive - real capacity maybe 700Gb, with luck - from Aus PC Market for $AU145.20, delivered. That's about twenty-one Australian cents per gibibyte, versus slightly more than six dollars for the Silicon Power SSD, the best-value one in this comparison in raw dollars-per-capacity terms. Even the almost-free CompactFlash option works out at a few Australian bucks a gibibyte. And, of course, the Standard Rule of Computer Hardware applies: If you don't need it right now, just hang around a bit. Then you'll be able to buy it cheaper. And these SSDs are plug-and-go items, easy as pie to install in an existing computer. If you need a lot of capacity, SSDs are obviously not the way to go. But you can still boot from an SSD and pack your PC with a bunch of cheap "1Tb" spinning disks for bulk storage. If you've been waiting until SSDs were fully cooked, wait no longer. They're here, they're fast, and you can afford one. The two best-value SSDs in this comparison are the 28.2Gb (real capacity) Silicon Power unit, for $AU170.50 delivered, and the 29.8Gb OCZ unit, which costs $AU198 but has a USB socket as well as SATA connectors. Australian shoppers who'd like to buy the Silicon Power SSD can do so by clicking here! 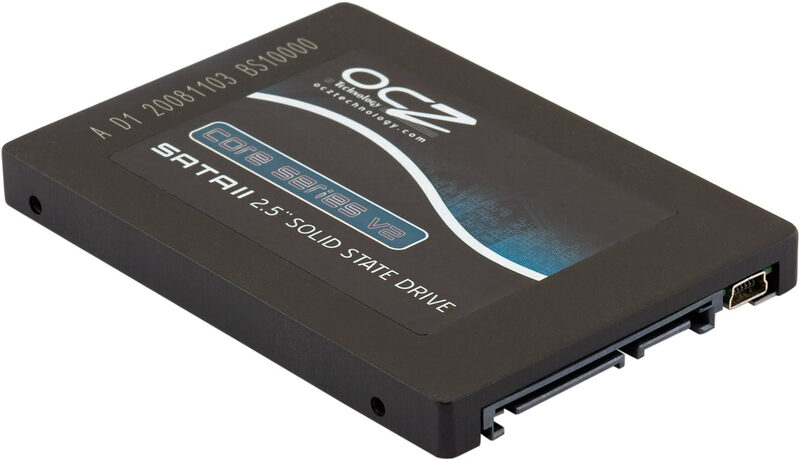 If you'd like to order the OCZ one, click here! Both of the above SSDs use cheap unbuffered MLC Flash technology, though, which can in certain circumstances have a serious negative impact on real-world performance, though there are several tweaks you can use to reduce or eliminate the problems. If you want to be certain you'll avoid the problems, get one of the more expensive SLC drives, like the Mtron unit. 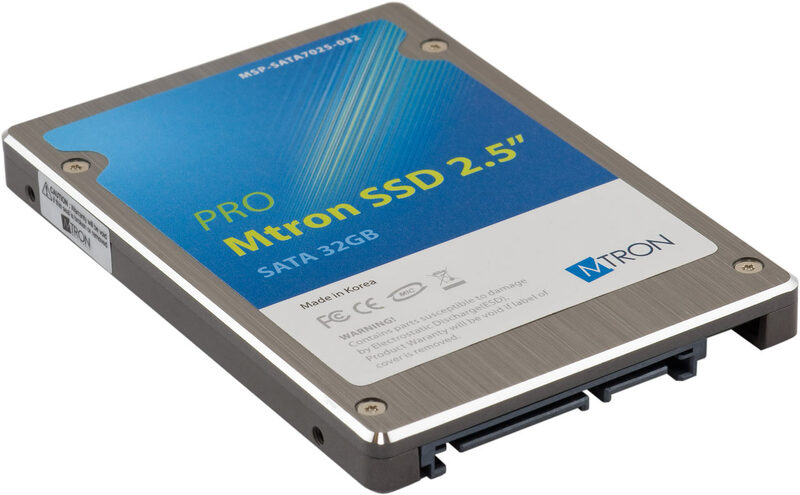 Aus PC Market sell the 29.8Gb (real capacity) Mtron SSD for $AU413.82 delivered. Australian shoppers who'd like to order one can click here to do so!